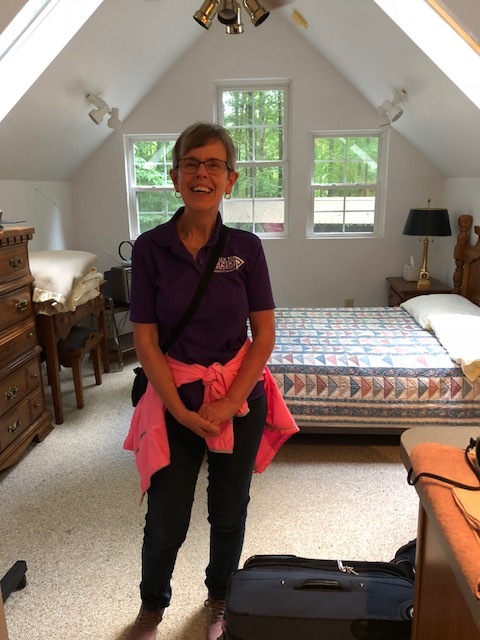 Ever since my trip to Naples last November (which I wrote about here), I’ve been wondering what it would be like to bring members of my AlzAuthors Management Team home. I’ve grown close to these women, who I’ve been working side by side with in a virtual office for about a year now. We are scattered around the country and beyond (our art director lives in Canada), yet we share an intimacy that’s hard to imagine, if you haven’t been an Alzheimer’s caregiver. 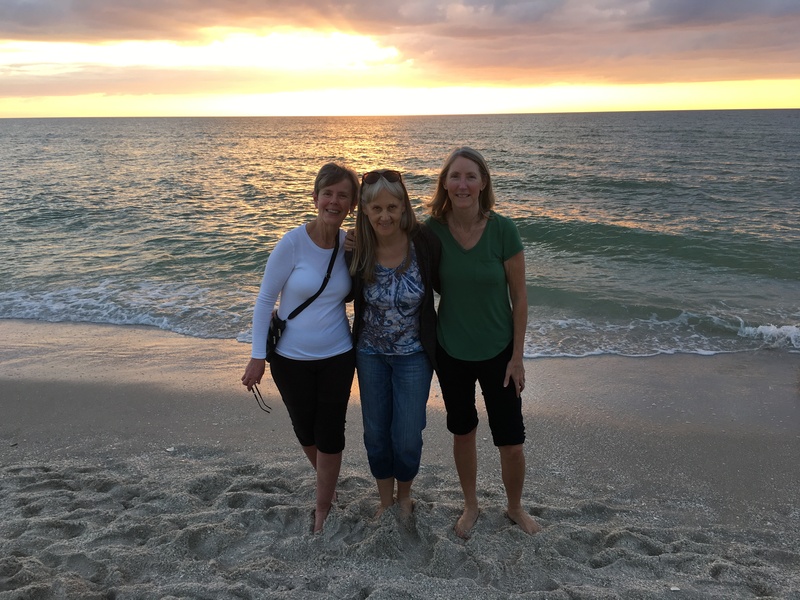 I met Jean and Vicki for the first time in Naples, Florida, last November. I’ve had the pleasure of meeting Jean Lee and Vicki Tapia once in person. I only know Marianne Sciucco, Kathryn Harrison and Irene Olson through social media and Google Hangouts. But I feel as if I know their hearts. I’ve read their books. I know their stories, and I know the passion they bring to the work they do at AlzAuthors. After all, who would think that a handful of volunteers would have collected and collated 170+ resources from around the world about Alzheimer’s and dementia? And that’s just a fraction of what they do. On Tuesday, I picked up Jean Lee at the airport. It was her first visit to Charlotte. 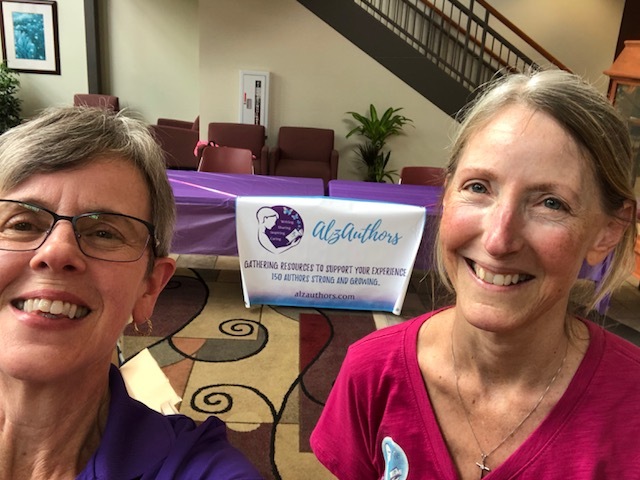 She flew in to join me in representing AlzAuthors at our local Dementia Education Conference sponsored by the Alzheimer’s Association – Western Carolina Chapter. Jean and I take a photo break after setting up tables and the AlzAuthors banner. We stopped at Panera Bread to have lunch before driving over to the Friendship Missionary Baptist Church on Beatties Ford Rd., where we’d be setting up for the conference. I don’t remember exactly what we talked about over lunch, just that we caught up on each other’s lives and expressed our excitement over bringing our authors’ books to share with caregivers at the conference. We probably brainstormed about ideas for future events and dreamed of seeing our whole team in person. I’m sure we talked of Vicki, who had hoped to join us, but had a trip scheduled to Ghana to visit family. We were so grateful for the wonderful work Kathyrn, our art director, had done on our new rack cards. We were amazed at the global expansion Irene was bringing to our team. At one point, we grew quiet as we read a Facebook post about Marianne’s mother, who had just passed away. I couldn’t help but think that her mom’s spirit was with us, urging us on in our work to spread the word about AlzAuthors. After lunch, Jean turned to me and said, “It would have been worth it just to fly in to have lunch with you, Ann.” Hearing her words, my heart melted. That’s the kind of warmth Jean exudes. Jean in the room over our garage. We spent a couple of hours setting up for the conference – figuring out the best design for our tables, securing our AlzAuthors banner, spreading out table cloths, unpacking books, cutting and curling pink and purple ribbons to tie on rack cards, snapping photos, talking with a few folks that wandered by. When we got home and I showed Jean the room over our garage where she would be staying. We were just in time for her to meet my daughter and husband, and for us to have a quick dinner and get a walk in before the sun went down. Jean folded into my family’s life as if she had lived with us always. Jean had shared with me that she lived in the woods and, like me, she walked most mornings. She is used to walking among trees, and she lives near a horse farm. So, my place felt familiar to her before she’d ever set foot on our property. She had seen photos of my farm and pointed out scenes she recognized. She mentioned the names of trees that were similar to the ones in Ohio and other plants that didn’t grow in her area. 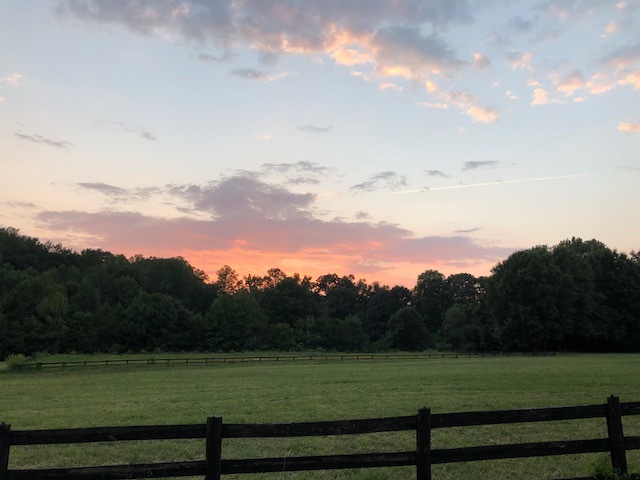 The beautiful sunset over the farm. Perhaps that’s how it is with caregivers. We can live in different homes and far flung states. But our caregiving roles are similar. The foliage and the bends in the road may be unique, but we recognize the paths each one has traveled. As we walked, the color of the sky deepened. A band of light hovered over the woods behind the pasture. 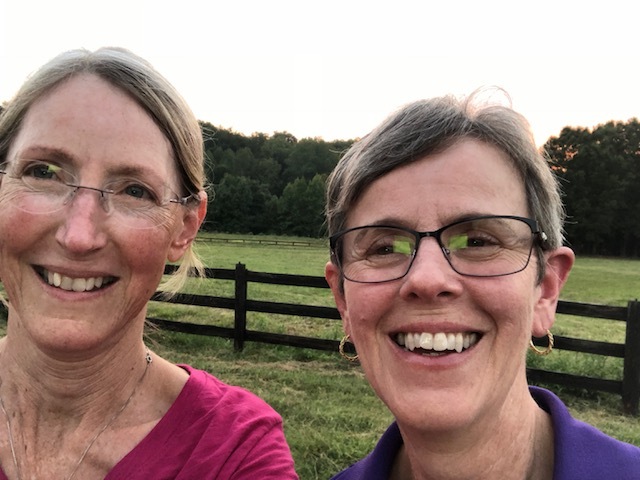 Jean and I tried to take a selfie with the setting sun behind us so that we could remember the beauty of this moment. But, of course, the camera focused on us instead of the sky. It was a warm Carolina evening, and we were sweaty and showing our age. We laughed when we saw the photo. This was us. This was life. But we were together. Something to treasure! Blessings on your time together, Ann and Jean. Thank you so much, Tryn. It was so very special. What a lovely post! So glad you had such a wonderful time together, helping others navigate the heartbreak of Alzheimer’s. Thank you, Cynthia. Working with so many wonderful books and authors was an honor and a privilege!